From The Atlantic "Pot on Brain of WH Questioners"
According to the White House,more than 90,000 people submitted more than 104,000 questions and cast 3.6 million votes on which to ask President Obama. The top-rated question under the category of "fiscal stability" is, you guessed it, about pot. "Would you support the bill currently going through the California legislation to legalize and tax marijuana, boosting the economy and reducing drug cartel related violence?" Top question in the budget category: "With over 1 out of 30 Americans controlled by the penal system, why not legalize, control, and tax marijuana to change the failed war on drugs into a money making, money saving boost to the economy? Do we really need that many victimless criminals?" Read more from the Atlantic. This has been an ongoing theme, but Advertising Age online has an interesting take on "listening" to social media from a marketers' perspective. The internet has made it easier than ever for consumers to get their opinions heard -- and for marketers to listen. But it also creates real challenges: Do marketers know who they're listening to? And at what point does the echo chamber of social media drown out the real opinions of the people who buy your brand? "The data is a really compelling reminder that a lot of our target consumers are not the people who are sitting on Twitter freaking out over a packaging design that they don't like," said Diane Hessan, CEO of Communispace. She added, "These are people online, having conversations, and yet they are totally out of the loop on stuff us marketing junkies love to obsess over." For example, in the past month, the Twitter community has been titillated by South by Southwest, AT&T, "Lost" and the redesign of Skittles.com. Missing from the list are things the Communispace and Lightspeed surveys, both separately commissioned on Ad Age's behalf, found that the general population is fired up about, such as the AIG bonuses and the bank-bailout plans. There's also the straight numbers game: While 64% of Communispace respondents had heard of Twitter, only 6% used it. The Lightspeed responses indicated even fewer users had heard of it (3%), and most of the 58% who had knew of it from someone they know or -- get this -- TV. Read more on Ad Age. So, what does this mean for government? As we move into social media spaces, we will need to learn to calibrate and understand the information that we receive. We cannot dismiss the concerns of a "vocal minority"--after all they are citizens, too--but not everyone is participating in social media tools. The unplugged voices count, too. Taking the pulse of the American public will continue to be a combination of traditional tools like polling, focus groups and election results as well as "listening" to social media. As we transition and incorporate new forms of participation, we need to be very careful about our conclusions and remember that we are learning. White House Using Google Moderator For Town Hall Meeting. And AppEngine. And YouTube. The White House is using Moderator, hosted on AppEngine, to determine which questions President Obama should answer at an online Town Hall meeting on Thursday. In just a few hours 6,932 people have submitted 7,037 questions and cast 236,048 votes on the site. Read more on TechCrunch. And, Holy Cow, The White House Has a Digg Clone. The White House has launched a new web site where anyone can submit and vote up their most important questions for President Obama about the economy. That's right - the White House has a Digg clone! At least for the next two days. Activity on the site will culminate in Obama addressing the top questions on Thursday, March 26. Read more on ReadWriteWeb. Transforming the Relationship Between Citizens and Government: Making Content Findable Online. [T]o truly make content available, it has to appear on the first page of search results for relevant queries on major search engines. What can government web sites do to be more findable? Findability is an in-depth process that involves both technical site architecture (ensuring search engines can crawl the pages) and content (ensuring the text is in the language of the searcher). As Kundra acknowledged, "“A two-way interaction between the government and its citizens,” he said, “will require a massive transformation by the government, on the back end, to ensure the government can deal with this new reality.”. But while a long-term plan to make government content findable in search engines is necessary, there are some basic steps that government sites can take to make content more visible in the short term. Read more from Vanessa Fox on O'Rielly blog. Fed Web Managers Featured on Radio. Did you hear Fed 100 Winner Sheila Campbell on Federal News Radio? Sheila talks about helping citizens complete their top tasks and the Federal Web Managers Council. Also, the April Government Web Managers Conference. Listen here. Get information about the Conference in D.C., here. 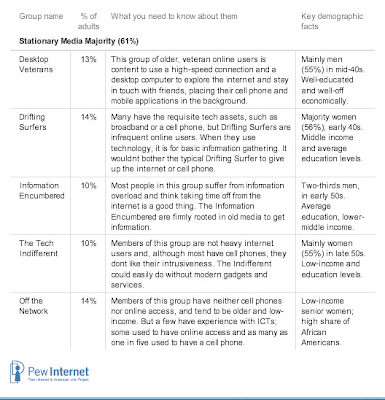 Pew Internet and the American Life Project has developed a new typology for internet users based on mobile internet use--phones. 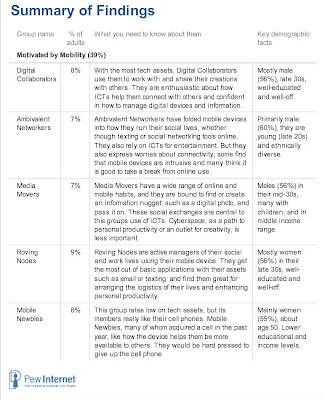 Their previous typology [pdf] was based on broadband and gadget adoption, but current findings of what makes a technology user elite is mobile internet use. For 39% of the adult population, mobile and wireline access tools have a symbiotic relationship. Mobile users typically have ready access to high-speed connections at home, which likely pushes them toward deeper home high-speed use; the digital content found on the mobile device may prompt more activity on their broadband-enabled big screen at home. At the same time, the desktop internet experience migrates to “on the go” as the handheld becomes a complementary access point to connect with people and digital content wherever a wireless network reaches. --Read more on Pew Internet. Pew found that younger people were more likely to be among the mobile elite, but one-fourth of the people 50+ join them. Where do you fit in? Where do your users fit? What are their expectations and what will be their expectations in the future. 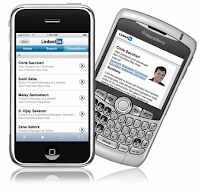 Are your websites and applications "mobile ready?" Read the entire study at Pew Internet & American Life Project. 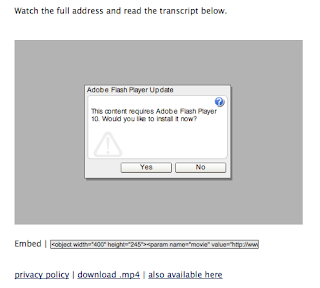 Kudos to Pew for making the entire report available online--without having to download a PDF. Nice! I especially like his statement that this is evidence of "unleashed web talent inside government agencies that had been shackled by the way things were always done." Yes we can! And I am going to take him at face value when he call out us "young" professionals who grew up on the web. I will also give credit to the Federal Web Managers Council and Web Managers Forum for the ease of implementation of the "/recovery" address. A common subdirectory was first used by all agencies a few years back to help people find and link to Hurricane Katrina resources. This has since become a model for interagency web linking. In the past few weeks, I was at more than one meeting that included a significant amount of stress--if not quite dismay--at the enormity of the Recovery.gov reporting task. And while there is still much work to be done [I am still waiting for that xml schema--I mean, come on, break it up, the schema for major comms is an easy lift and a quick success], the high expectations set from the start is translating into getting the work done. Government agencies across the country are sitting on gigabytes of valuable digital data that could be mashed, mixed and re-organized in crafty ways by Web 2.0 entrepreneurs and public interest groups engaged in everything from government oversight, to providing practical information to Americans. Yet, despite federal and state public records laws designed to make the data accessible, many agencies are fighting more ferociously than ever to keep data created with public funds out of public hands. In their battles to withhold information, bureaucrats are citing everything from copyright and trade secret privileges to privacy and national security concerns. -Read more on Wired. It's the clash of the titans. In one example from Wired, a nonprofit requested anonymous information about patient diagnoses, along with the physicians' identifying number, the procedures performed and amounts billed to Medicare to help match patients to experienced doctors for specific procedures and to determine if practitioners were over-billing Medicare or receiving government funds for high-risk procedures they didn't have the experience to perform. The nonprofit wanted to make this information available to consumers via their website. But the U.S. Department of Health and Human Services--parent of Medicare--denied the request on grounds that it violated doctor privacy by disclosing physician incomes. And therein lies the rub for more than a few datasets: individual privacy and personally identifiable information (PII). Information that had been gathered painstakingly using paper and data cards and maps stored in City Hall are now much easier to put together and much easier to access. And data gathered for one purpose might be very useful for another, unrelated purpose. One that the data owner did not necessarily agree to. No agency shall disclose any record which is contained in a system of records by any means of communication to any person, or to another agency, except pursuant to a written request by, or with the prior written consent of, the individual to whom the record pertains... (See the Department of Justice for the Privacy Act of 1974). We are experiencing a huge shift in data accessibility. Example of Big Shift #1: When we were buying our house in the early 1990's, I had to go downtown during "business hours" to research the amount of money that the current owners paid. [They were claiming that they were going to lose money on the transaction, and the data showed otherwise!] Now, anyone can go to WashingtonPost.com and see the price we paid. Example of Big Change #2: A few years ago, we used to call people to get directions to their houses. (Make a right at the second light there's a 7-11, then you'll drive by the house with the gnomes...) Now you give me a number and street, I can easily get specific directions--and even a picture--of your nearby Starbucks or your house. From my GPS enabled cellphone. So what?, you say. Well, the Supreme Court, privacy advocates, and just plain people who don't want everyone to know how much money they make are concerned about making private information--or information that they consider private--easily available and combinable online. The barriers of time, location, and, even, expertise have fallen away. It changes the entire game. In many, many cases, the PII can be scrubbed from the data set. But in some subset of cases, when data sets are combined, PII is exposed. This is the true clash of the titans--transparency versus privacy. The public versus the personal. Increasingly, it is government between these two giants, trying to balance and move forward (okay, and to be honest, sometimes playing one against the other to meet other, less pure objectives). We live in interesting times. There are real problems to solve. We got some work cut out for us. Very cool project from the U.S. Geological Survey to digitize over ninety years of data cards on bird migration. 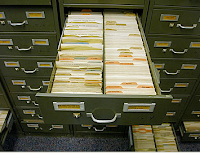 Many valuable datasets remain trapped in paper and untapped by modern researchers in many research organizations. The National Oceanic and Atmospheric Administration's Climate Database Modernization Program, for example, has already generated 57 million images and seven terabytes of data from old, often handwritten documents. But it's expensive to pay for scanning and transcription, which is where the crowdsourcing comes into play. "You would normally just hire someone," Droege said. "We would ship it off to a company, and they would enter it into a database for us, and it would all be very professional and cost a million dollars. We don't have that budget so we had to think outside the box." Jessica Zelt, who is coordinating the three-week-old effort, said that 400 people had already signed up to help. Participants who want to help go through a simple sign up and 15-minute online training, then are loosed upon the millions of cards scanned in the database as image files.--Read the rest on Wired. Lesson: government doesn't HAVE to do it all. There are people who are willing and able to help out. Just need to ask. And, if you want to participate on the digitizing project from the comfort of your own home, sign up at the US Geological Survey site. According to the latest data from Hitwise, Twitter sends most of its traffic to Google, Facebook, TwitPic, and MySpace. Overall, Twitter sends about 1 in 5 users to social networks and another 1 in 5 to entertainment sites like Twitpic, YouTube, or Flickr. Even though some people think that Twitter is just a 'poor man's email system,' Twitter's clickstream profile is very different from that of most email services. There are a number of interesting results in Hitwise's study. Among others, Hitwise notes that a higher share of downstream clicks from Twitter.com go to blogs and personal websites than from search sites, social networks, or email services. A larger number of Twitter users are also being sent to news and media sites, which points towards Twitter's growing role as a medium for sharing and breaking news stories. --More from Read Write Web. Twitter is a great place for folks to share links to resources. Makes sense to get gov links on Twitter. An easy way to use Twitter is to automatically send your agency RSS blog or newsroom feed to Twitter by Twitterfeed. Not the sexiest use of Twitter, but one that doesn't have much lift and can help broadcast information. See, for example, the Department of Labor twitter account. Clay Shirky's latest blog post, Newspapers and Thinking the Unthinkable, has got me thinking and thinking, some of it may be unthinkable for dotgov. While Shirky is talking directly about the newspaper industry, he is also talking about our current world and all our communications and interactions. Including those interactions that kept people at arms' length from government--finding the legislator, writing a letter, addressing and mailing the letter; or making appointments to stand in line at the DMV; or even knowing that there was a regulation that affected your neighborhood or industry that you might find, read, and write or fax a comment about--are falling around us. 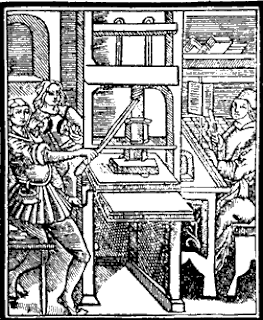 The printing press didn't just give us books, it gave us literacy. So when you ask me what this means, I can't tell you. We are living it. And it is happening all around us. And someday we will know the results. Right now, though, citizens are demanding services to be delivered with an immediacy they expect from Amazon or Craig's List or Netflix or Hulu or Limewire. People will ask, why are you making a four color tri-fold brochure? I just want the information on my cell phone. Why can't I access my student loan information online from my own bank? Why do you have a paperwork reduction act and then make me fill out a form in triplicate, asking me for the same information I gave you before? Why can't I look at a bill 5 days before the President signs it? And more importantly, why can't it be written in English? Can't we get the clever bloggers to rewrite it? And many people serving in government will be confused. Some will resist. Some will be the experimenters. But no matter what, we are living in a time of great change. So, what are the unthinkable thinkings for our government? Read Shirky's entire post here. 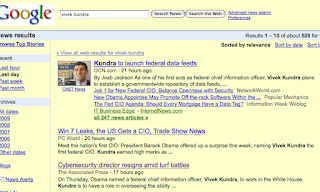 Shorts: Navy and Web 2.0, CMS Hurdles, CIO New Job or New Title? Navy Considers Web 2.0 Tools. Navy officials want to adopt Web 2.0 tools such as Facebook and Wikipedia, but they will likely deploy their own versions of those technologies, said Robert Carey, the Navy Department’s chief information officer...."However, Web 2.0 technology is not designed for use in a strict command structure," Carey said. “It does flatten the organization, which makes us nervous because we’re not a flat organization, we are a rank organization,” he said. Read more on Federal Computer Week. Obama Call for Citizen E-Participation Will Encounter Technical Hurdles. "Washington is abuzz about new possibilities for federal web publishing, but actually executing on a strategy of greater transparency combined with public participation will be difficult," notes CMS Watch founder Tony Byrne. "Web CMS vendors and Social Software suppliers can talk a good game about offering a unified solution to this challenge, but their architectures have not caught up with their marketing here." Byrne adds, "In particular, agencies will find that their existing Web CMS infrastructures are not up to the challenge of public participation." See more on CMSWatch. Is CIO Gig New Position or New Title? [OMB] assured us that Kundra is, indeed, taking the Evans job, which since its creation in 2001 has sometimes been informally referred to as a "CIO" post. The e-Gov and IT chief is essentially responsible for coordinating government IT strategies across agencies, and chairs the federal CIO Council, comprising the CIOs of individual agencies. So is this just old wine in a new bottle—or at least a sexier label? Well, not exactly: apparently the CIO position is a distinct but "complementary" job within OMB, with a big-picturey mandate to transform the way government agencies use tech to interact with the public. In other words—or so it seems to me, anyway—it actually is the same job, but adding the CIO title reflects the broader scope and increased influence and prominence the administration expects Kundra to have, given that e-Gov head has traditionally been a fairly low-profile post. Read the entire post on ArsTechnia. It seems that everyone has their heads up in the cloud--cloud computing. There also seems to be more than a few people who misunderstand what it is. Some people actually believe that there is a magic cloud "up there," where magic happens. For free. Cloud computing is the concept where agencies put software and information on the Internet so it is accessible from anywhere, at anytime. It is similar to the services offered by Google, Yahoo or companies that provide online e-mail or document access.--More from Federal News Radio. While true in "concept," the cloud is physical, too. You don't "put software on the Internet." Software and data have to be hosted somewhere, just like on your hard drive. The "cloud" is really a third party server farm that you can buy (or use) a portion. It saves money because a business or government doesn't have to maintain servers and you can increase or decrease capacity as needed. 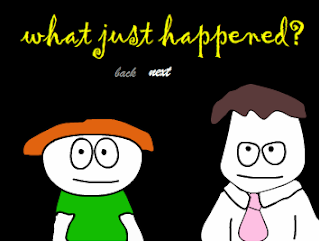 Here is a great little video that talks about cloud computing. It will help you in your discussions either by making you smarter or as a resource to help make others around you smarter. what types of metrics and reports do you run? Are most of your reports generated in an ad hoc manner for spot analysis for senior management? Or do you focus on creating a self-service environment in which content managers and marketers act as “power users” who can take care of their own analytics requirements? As they say, you can't manage what you can't measure. For government and nonprofits it's a bit harder since metrics like sales are not always meaningful. You don't have to be a member of the Web Analytics Association to take the survey. It only takes about 10 minutes and will hopefully spur a dialog and best practices for public sector analytics. One of the comments from Transparency Camp, "E-mail is broken." I agree, but even if you don't think it's broke, I bet you're using e-mail very differently than you did just a year or two ago. Nielsen Online, an analytics firm that tracks time spent online at various websites, has issued a report finding that throughout 2008 social networking sites and blogs saw more time spent by users than personal email. Youth watchers have long argued that for young people, email is how you communicate with elders in formal situations, while social networks and SMS are the preferred method of communication among peers. Nielsen found, however, that Facebook in particular saw greater growth among older people than it did among the young. "This shift has primarily been driven by Facebook, whose greatest growth has come from people aged 35-49 years (+24.1 million). From December 2007 through December 2008, Facebook added almost twice as many 50-64 year old visitors (+13.6 million) than it had under-18 year old visitors (+7.3 million)." -- Read the rest. E-mail remains a critical communications tool, but if dot-gov is going to go where people are spending their time, social networking sites need to be considered as a part of the strategy mix. Second, please, please, PLEASE see the very funny blog entry from the Smithsonian. Michael Edson put together a very funny, very true animation cataloging the reasons why social media has no place in government. If you have come up against a roadblock in your agency, get a laugh and some very good responses to common concerns--like losing control, what if it's wrong, we have been doing it this way for a long time, blah blah blah. See the Smithsonian 2.0 blog. In Ghostbusters, after an especially electrifying experience with the bad guy, Winston advises Ray, "If someones asks you if you are a god, you SAY YES!" Normally, I think that this is very good advice. But in the case of incoming federal CIO Vivek Kundra, I would recommend hedging a bit on this kind of assertion. Not that he needs to assert his diety-ness himself. A quick Google news search this afternoon found 247 news articles on the D.C. CTO geek-superstar--most of them with high praise, and high expectations. And these expectations are not checked at the media door. Speaking to folks working in dot-gov, many of my colleagues are really excited by the changes that the innovative, out of the box Kundra will bring. All this expectation, and the new guy is bound to #fail. What are feds waiting for Kundra to do? To come into Dodge City (DC) and clear the town of the troublemakers? As a matter of fact, Kundra cannot do it without the help and support of the very feds who see him as riding in on the white horse. WE ARE KUNDRA. Ghandi said, "You must be the change you want to see in the world." This isn't the time to wait for someone else to make things happen, it's time for us to make change happen. While not all dot-gov is about social media--despite heavy news and buzz coverage--it certainly is growing in importance. Social media includes blogs, social networking sites like Facebook and MySpace, microblogging platforms like Twitter, social bookmarking like delicious, collaborative tools like Wikipedia, and more. These tools provide new avenues to deliver government services and communicate--two way!--with citizens. Even as the policy issues in using social media in government are being worked out, it's not too early to understand and figure out how to use these tools in your own agency. Ten Common Objections to Social Media Adoption and How You Can Respond: From Read Write Web: An excellent article that list each of the top 10 common objections to new online tools and provides advice on what you can say in response to each of them. From I to I don’t have the time to contribute and moderate. Top 10 Reasons Brands should Listen to Social Media: From Power Shift - Social Media Blog: There are a multitude of reasons for paying attention to what’s being said in social media. This article lists the top ten which include uncovering complaints so you can remedy them and identifying customers who praise your products so you can use these as testimonials. Take a look at these even if you are not ready to convince your boss. You might be the one who needs convincing, and the time to research is now. If you liked the examples above, see more here. Web-Savvy Obama Team Hits Unexpected Bumps: The team that ran the most technologically advanced presidential campaign in modern history is finding it difficult to adapt that model to government. WhiteHouse.gov has a blog and a YouTube channel, both firsts for a president. The online unit, which numbers at least seven, is larger than any White House has had, but it is not configured to replicate the campaign's work. New Media Director Macon Phillips said, "We're not running a campaign anymore. To us here, WhiteHouse.gov is not just a Web site. The new programs that we will roll out are more than just URLs. They are new ways to engage with citizens. Stay tuned." More on Washington Post. Pentagon gets a blogger of its own: The Defense Department's in-house wire service, is taking a page from the bloggers and offering up a new new series of Internet reports from one of its own. Fred W. Baker III, who is currently on an extended assignment in Afghanistan, has a dedicated page on the Department of Defense website. It's a slick multimedia setup that combines video, photo essays and dispatches. More from Wired blog. Had the very good fortune today to attend Transparency Camp sponsored by the Sunlight Foundation. I haven't been to an "un-conference" before. Attendees put together the agenda on the fly, with sessions developing and held in available rooms. The real value is the convening of a great assemblage of geeks, consultants, practitioners from dot-gov both executive and leg branches, nonprofits and the private sector. Transparency has become a key touchstone since President Obama issued his oft-quoted Transparency Memo. There was useful discussion about why transparency is important, the risks and costs of transparency and of not being transparent, privacy, recovery.gov, and crowd-sourcing (specifically the issue of the pot-people). 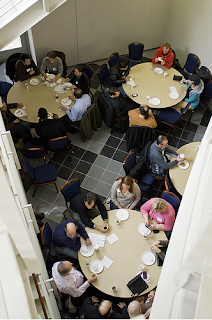 There was a lot of energy in the Camp (especially when geek superstars Tim O'Reilly and Craig Newmark were in sessions). Sessions ranged from technical to theoretical to how-to. During my sessions, people were talking about the importance of representative democracy as outlined in our Constitution and the hope that technologies will make government more responsive and more of the people, by the people, and for the people. The folks in the room are the ones who will help to make it so. You can get a feel for the Camp and see the twitterstream here.